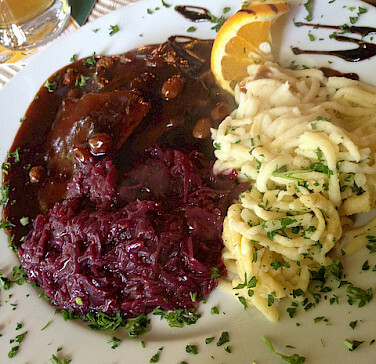 Welcome to the heart of the Rhine region! 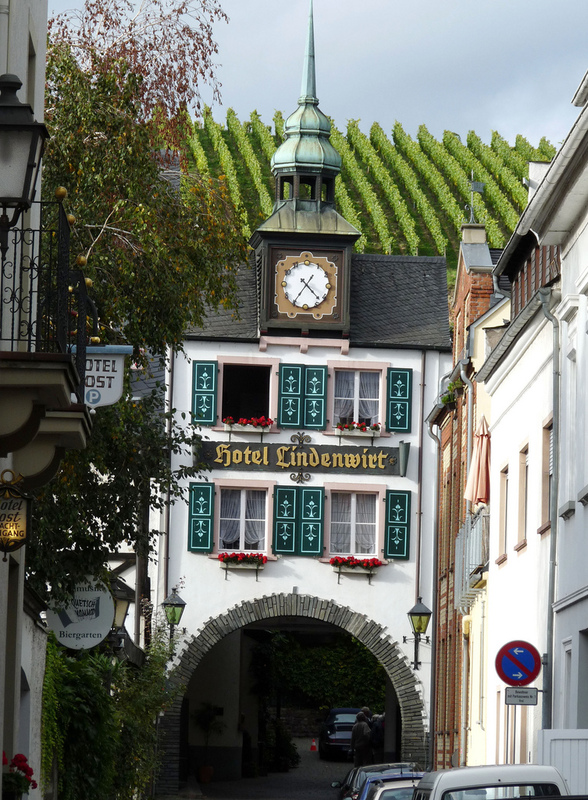 On this bike and boat tour in Germany you will navigate the meandering waterways, bike the river paths, and travel through history in a timeless landscape dotted with castles and climbing vineyards. 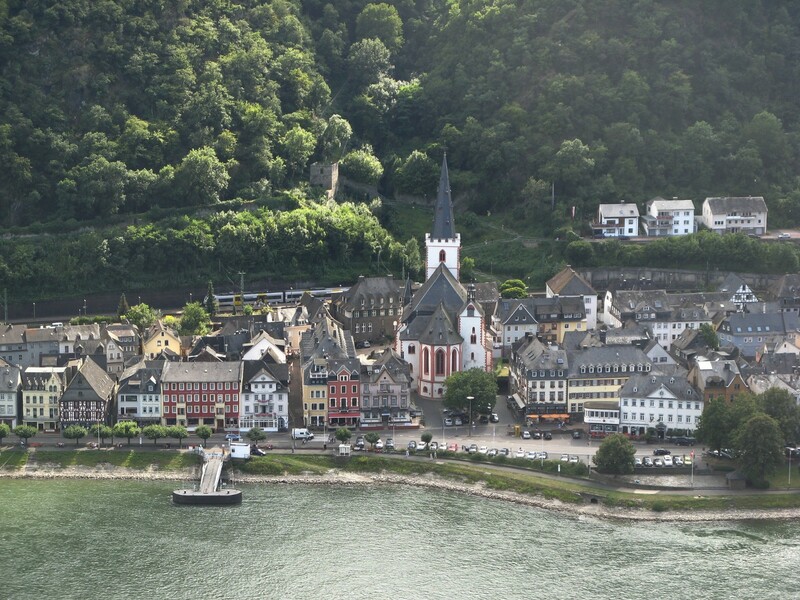 Much more than a shipping highway, the Rhine River is the pulsing economic vein of Germany and Europe. Around every bend, legends spring to life; the plunging Lorelei cliffs, The deadly Bingen Reef, and the fabled site where Rheingold is buried. 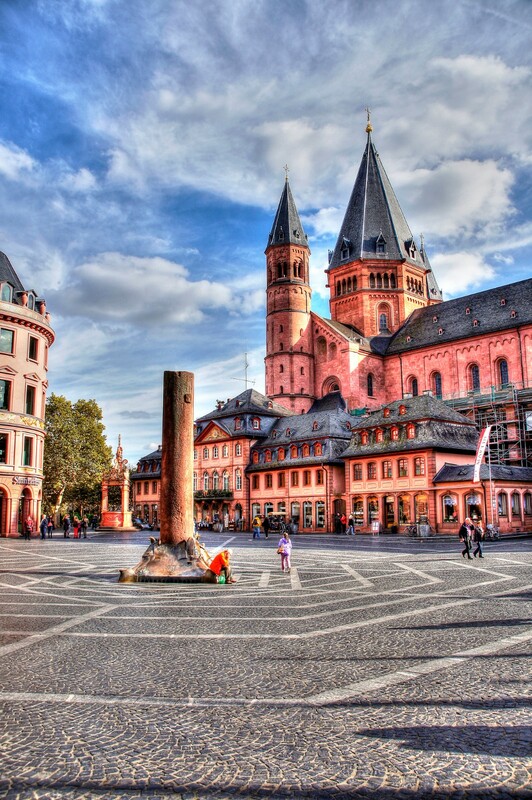 At Mainz, you navigate the Main River, entering into the Franconian region, with great historic villages and world famous cities like Frankfurt. 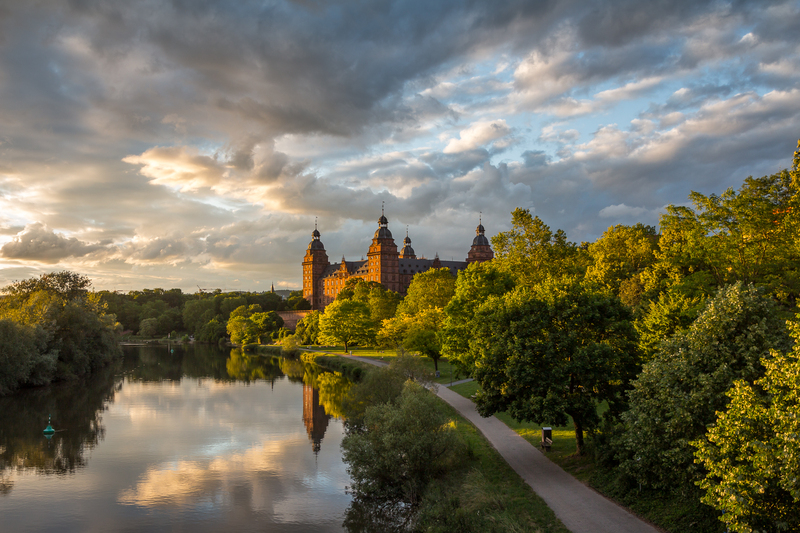 You will discover lovely Aschaffenburg, a typical Bavarian town, and fitting end to your bike and boat tour in Germany. 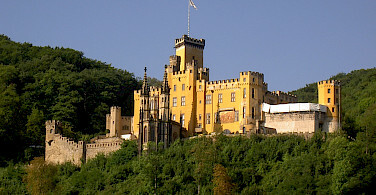 You can combine this tour with Amsterdam to Koblenz bike and boat tour to create a 15 day tour! 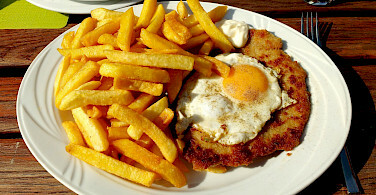 Want to see more Bike and Barge tours in Germany? 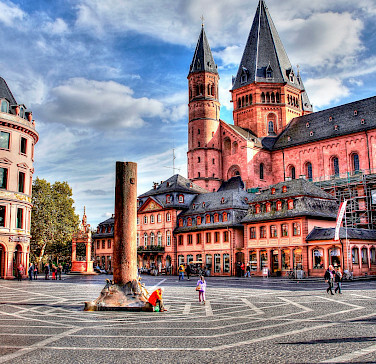 Closest international airport to Koblenz and Aschaffenburg is Frankfurt International Airport (FRA). Check local conditions prior to arrival. Average high/low temperature for the month of May 61º/46º. 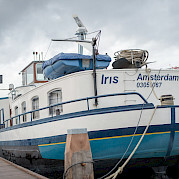 Accommodations aboard the comfort plus boat, the Iris. This is an easy, guided bike and boat tour with average daily distances between 10 and 31 miles (15 and 50 km). *All distances are approximate. Itinerary is subject to last minute changes due to unforeseen circumstances such as wind, weather, changes in mooring locations, etc. 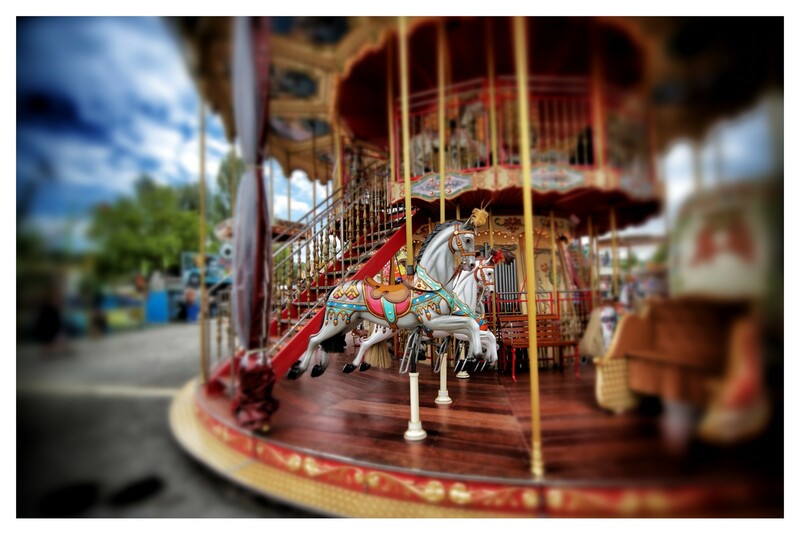 Today you join the IRIS, docked in Koblenz, and enjoy the day in town. 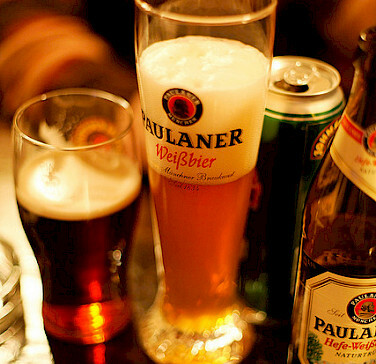 If you arrive early enough you can join the guide for a city-walk. Embarkation begins at 2.00 pm. 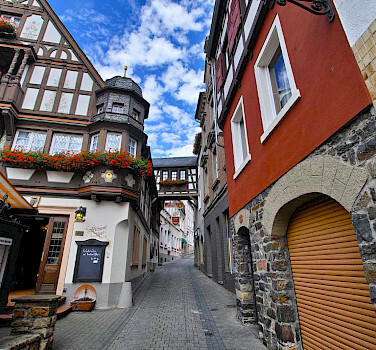 Koblenz has a beautiful “Altstadt” (old city) in the triangle between the Mosel and the Rhine River. Stroll around, join the cable car to the top of the hills and enjoy great views of the rivers and the city. 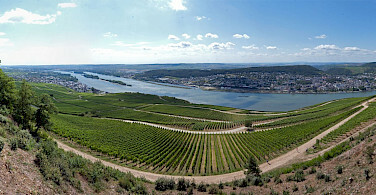 Koblenz is the place where the Moselle floats into the Rhine. 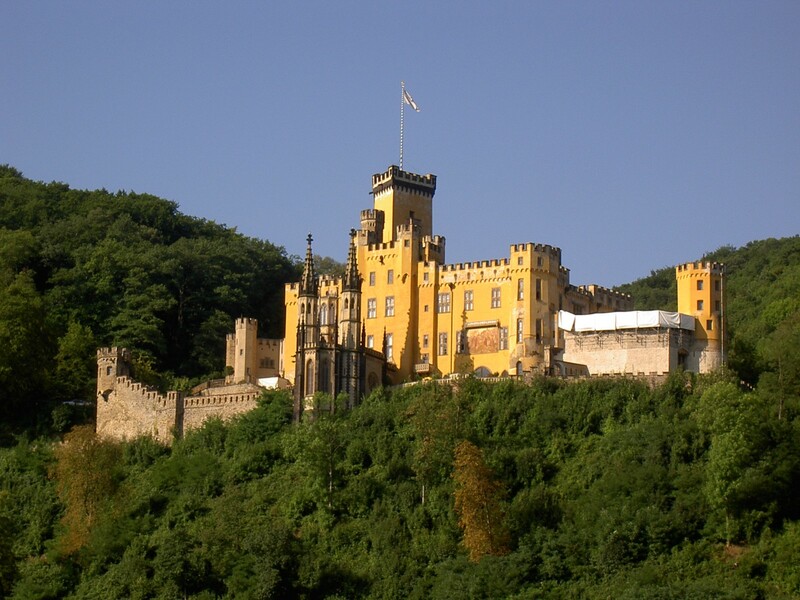 You will enjoy an early morning sail up to Winningen, and there you start biking to the Burg Eltz, well hidden in the hills. This Castle is different from any other castle. 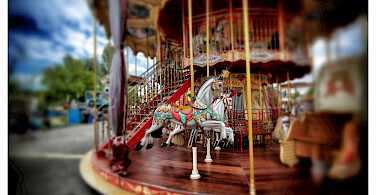 It has remained unscathed by wars and has been owned and cared for by the same family from when it was built until today. 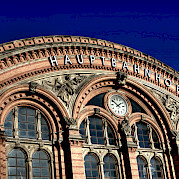 Its architecture has no comparison and many of the original furnishings of the past eight centuries still remain in place. There is a Treasury and Armoury boasting world-class artworks in gold and silver. It towers high on a large rock, but is still in a valley! Back on board the Iris, you will enjoy an afternoon and dinner cruise back to Alken where the boat will dock for the night. 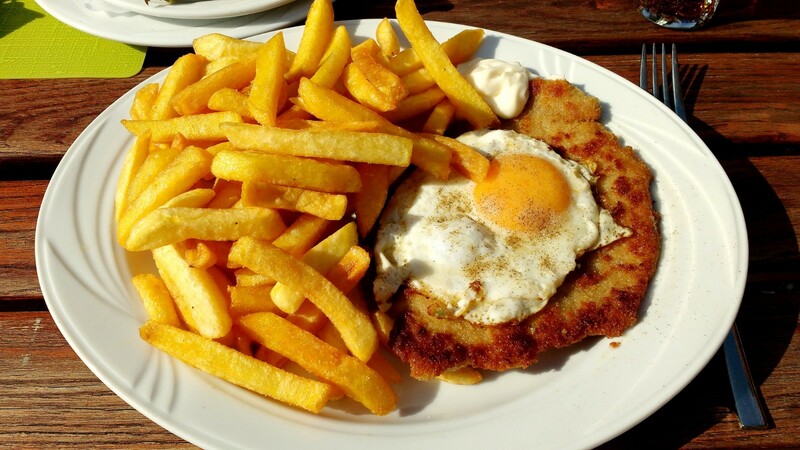 The barge takes you back to Koblenz as you begin your day. After breakfast, the cycling begins, first leading you to the ancient city Boppard. Here the Rhine takes an amazing turn, nearly 180 degrees. 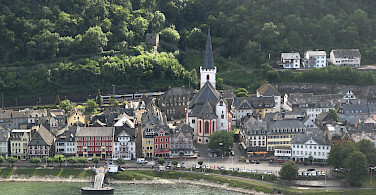 Boppard has always been a visitors magnet with her precipitous vineyards and one of the nicest bank promenades on the Middle Rhine and the oldest preserved Roman fort walls to the north of the Alps.The destination is St. Goar, opposite famous Loreley. A ferry and a bus bring you up to the Loreley. 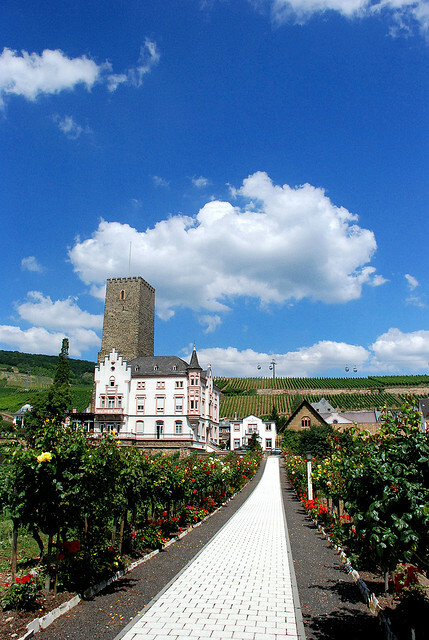 A hiking path leads up to this lovely spot and offers a beautiful sight to the narrowest part in the romantic Rhine Valley. The morning begins with a great sail along the Lorelei. 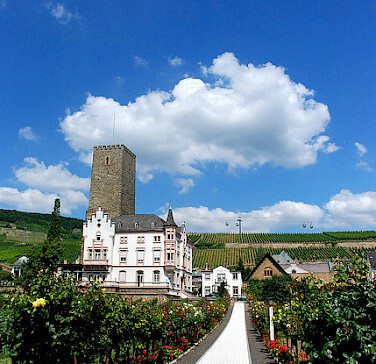 You join the bike path again and pass by pompous castles and reach Ruedesheim. Some of the vineyards date back to Roman times. 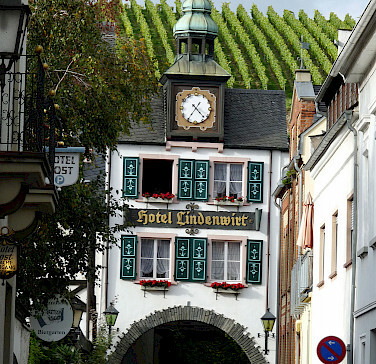 You will stroll through the “Drosselgasse”, famous for its entertaining music and taste some of the wines of this wine-village. 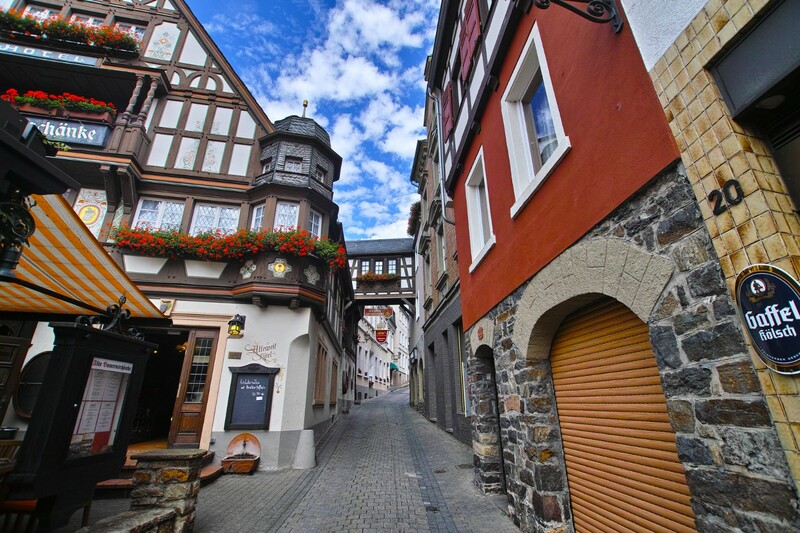 This small old “gasse” is only 144 meters long and has 37.508 paving stones. 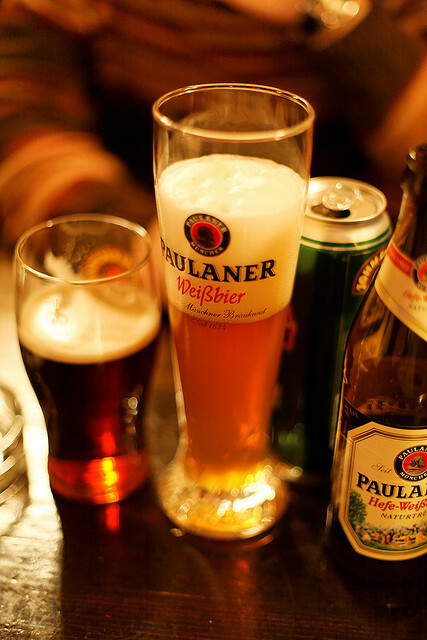 At the Asbach centre, you can taste German's Brandy, produced locally since 1892. You’re not into brandy? They produce some great chocolate as well. 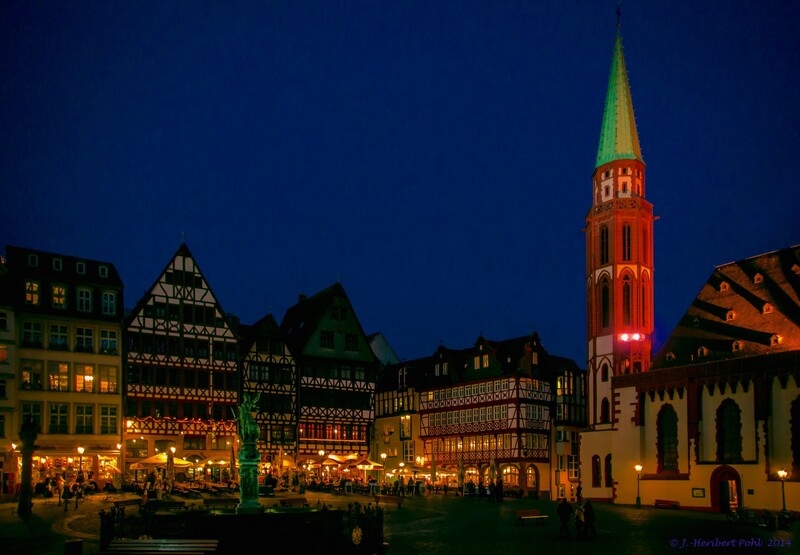 The old town, dating from the Middle Ages, and parts of the city’s fortifications like the Adlerturm (eagle tower) are well preserved. 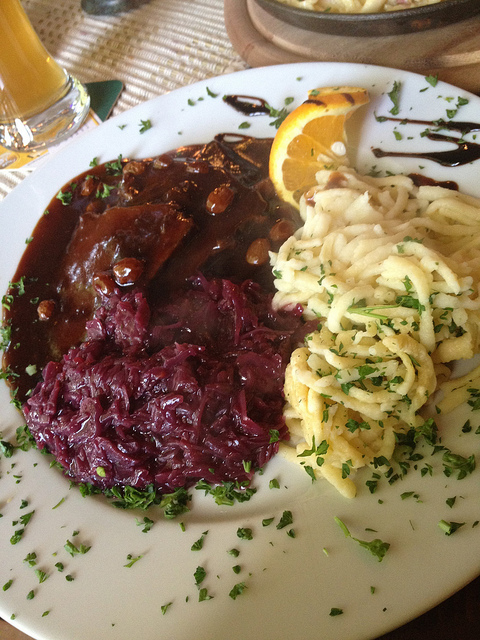 Here you will find cozy traditional wine taverns in historic half- timbered houses. 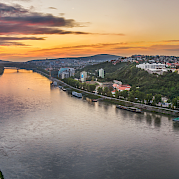 The route leads along the Main River to Frankfurt, one of Germany’s largest cities and home to the Frankfurter Messe (Fair), home to fairs since 1240! A Trade-City, home to banks and stock markets. The city skyline is very contemporary due to these developments and also because of the destruction in the second World War. 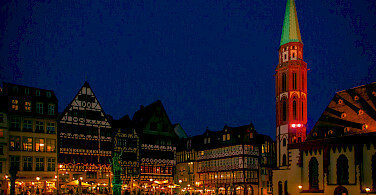 Now Frankfurt is home to a many museums located at a special area at the riverside and famous for its annual Buchmesse (Book Fair). You can view all of our bike and boat tours or look at our featured bike trips, specials, and news. This tour is run by MPS IRIS BV.